Lok Sabha Elections 2019: Rahul Gandhi had announced a minimum income guarantee scheme assuring Rs. 72,000 a year for 20 per cent of the poorest in the country, if the Congress is voted to power. Rahul Gandhi said the Congress had been working on how to eradicate poverty for the last six months. 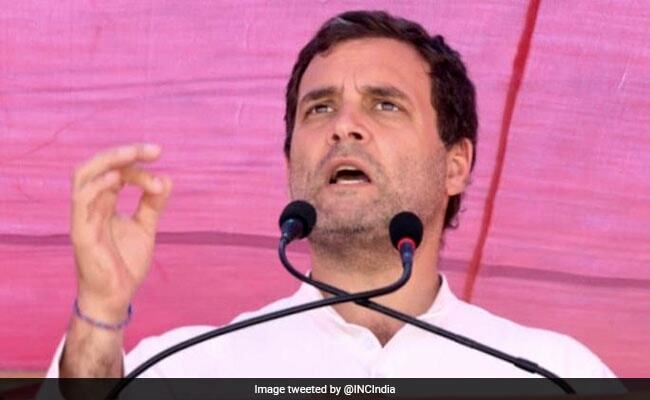 Congress president Rahul Gandhi promised a "surgical strike" on poverty a day after he announced the Rs. 6,000-a-month dole plan for India's poorest families, if the party is voted to power. He also kept up his attack on Prime Minister Narendra Modi and his government. "We will eradicate poverty in the country. This is a ''dhamaka (blast)''. No country has done this in history. There should not be a single poor person in the country," Mr Gandhi said at a campaign rally in Rajasthan's Suratgarh. Mr Gandhi said his party had been working on how to eradicate it for the last six months. Yesterday, Rahul Gandhi announced a minimum income guarantee scheme assuring Rs. 72,000 a year for 20 per cent of the poorest in the country, if the Congress is voted to power in the April-May national election. Nyuntam Aay Yojana (NYAY) scheme, said the Congress chief, would lift five crore families or 25 crore people out of poverty. "If (Narendra) Modi gives money to the rich, the Congress will give money to the poor," Rahul Gandhi said. The ruling BJP, however, has slammed the Congress scheme, with Union Finance Minister Arun Jaitley calling it chhal-kapat (deceit) and bluff. "Congress has historically believed in political transactions in the name of removing poverty," he said. Rahul Gandhi, who has repeatedly accused PM Modi of corruption and crony capitalism in the Rafale fighter jet deal, said,"He (the Prime Minister) says, 'Main chowkidar hoon'' (I am a watchman). He did not say whose chowkidar he is. Have you seen a chowkidar at a farmer''s home? Have you seen a chowkidar at home of the unemployed youth?" he said. The government recently implemented the a scheme for farmers that promises Rs. 6,000 a year to small and marginal farmers. It aims at 12.5 crore beneficiaries.